Two of my favorite herbs to use fresh in winter, are basil and rosemary. Rosemary is evergreen in the Seattle area. I keep two pots of rosemary on my deck, pulled close to the house when the wintry frosts are prevalent in December and January. About once a month, I go out there and clip off a few sprigs, to keep in a drinking glass, with about 1 inch of water in it, in the fridge. I don't cover the rosemary, as I do with parsley, but leave open on a shelf. 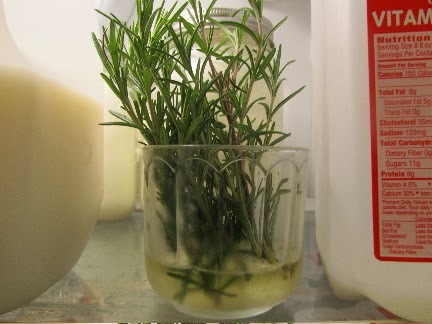 When I want rosemary for cooking, I simply reach inside my fridge, and there it awaits me. Rosemary sprigs, kept this way, last about 1 month, for me. 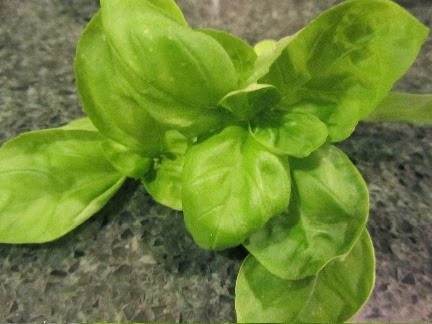 Basil is my other favorite fresh herb to use in winter. I keep a pot of living basil on the windowsill of my kitchen. In early August, I plant a pot of basil seeds, and keep outdoors for a month. Around mid-September, I bring this pot of basil into the kitchen, to sit in the sunny window on the south side of the house. I have fresh basil to pinch off when I want it all winter long. This last week, I added fresh basil leaves to an onion and cheese pizza, just as I pulled it out of the oven. And rosemary is a regular addition to winter favorites like oven-roasted potatoes, rosemary French bread, lentil soup, and focaccia. Do you grow herbs indoors in winter? Do you have one of those fun aerogardens, for growing under lights? How about a sunny windowsill where you grow an indoor herb garden? Presently, I don't have any herbs growing inside. 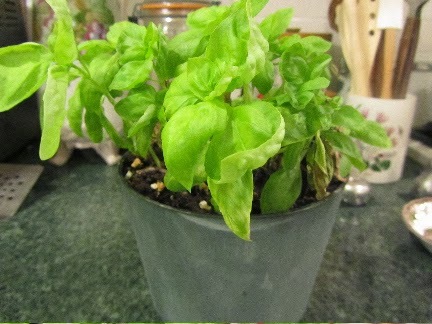 However, some years I take cuttings from the basil plants at the end of the season and root them inside. That seems to work okay, however starting them from seed might work even better. I've never tried to root basil cuttings. How interesting! I wonder what other herbs can be rooted easily? I don't have any windows in my kitchen. I grow rosemary and parsley outside all year long, so I cut those from outside. I have been drying basil to use that way, but I know you can freeze it in ice cube trays with a little water to use that way as well, though I have never done it. I am planting more basil each year but I still cannot plant enough for what we use. You are so fortunate to be able to grow herbs outside year round! For freezing basil, I do freeze some of my garden basil. I don't do it in water in ice cube trays, but just minced and put in plastic bags, without extra water. 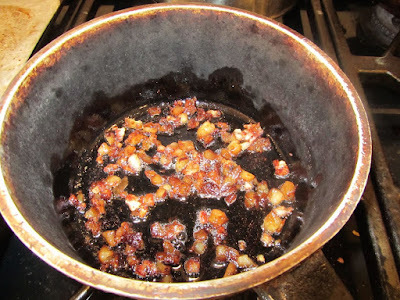 It breaks off easily into chunks for cooking. Easier still just put the leaves in a plastic bag and freeze. Crunch the frozen leaves and you have chopped basil, no knife required. I do it all the time for Tomato-Basil Soup. I've never tried that, but will give it a shot this summer. Thanks for the tip! Thank you for those suggestions! I love basil and like The Prudent Homemaker, I don't ever have enough! I'll be sure to plant some in August to bring inside. I also love rosemary and would love some now for some cooking I've been doing, but I refuse to pay $3-4 for a sprig! You can grow potted rosemary indoors, over winter, in a cool window. I see rosemary seedlings at the garden center for about $3 at the end of the season. Repot into a larger container, and you can grow it indoors until warm weather returns. It will grow leggy, of course. You may have seen mini rosemary Christmas trees around the holidays. These are intended to "live" inside for winter, then move outdoors in spring. I couldn't fathom spending $3 to $4 a sprig for rosemary, either! Believe it or not, but I killed a spearmint plant 2 seasons ago. I've got to look for spearmint seeds again and start over! I keep my mint plants on large pots, partially sunk into the ground. That controls the spread to a certain extent, but not completely. I really need to plant some sort of garden this year. I see all these wonderful herbs and produce that you have grown and I am green with envy! I've never gardened before in my life. What are some good beginner herbs and vegetables? I suggest you start with a tomatoe plant. 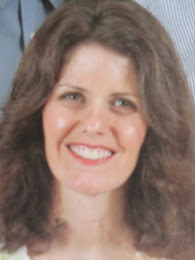 They are easy to grow and will give you confidence to go on to other various foods. my best advice is to start small, as you've never gardened before. You may discover that you detest gardening, and there you are, with half the yard tilled and needing planting before weeds take over. Container gardens are a great way to begin small. As frugal spinster suggested, tomato plants are good for beginners. Find a variety that can be grown in a large pot, like a cherry tomato. Also, summer squash seems to grow for just about everyone. There are varieties which can be grown in large pots, as well. And depending on your climate, leaf lettuce in the cooler months is always a rewarding veggie. For herbs, chives, parsley and dill seem to be easy ones, and will do well in pots. All three can be grown from seed with success for most people. Follow directions on starting the seeds. For example soak your parsley seeds in water, for 24 hours before putting into starting soil. Actually many herbs are easy to grow, including rosemary, thyme, basil. Grow the herbs that you think you would enjoy having access to on your back porch or deck. If you mosey on down to your local nursery, you can ask the attendants there about what grows well in your area.